On Wednesday the 13th of June Incognito has organized a party together with Luna-tik, the study association of Psychology. The ideal occasion to meet some new people, and to talk about something NOT computer related for a change 😉 The official poster is included with this e-mail. The party will be held in the Backstage (http://www.backstage.nu), that’s why we chose for the theme “Underground”. 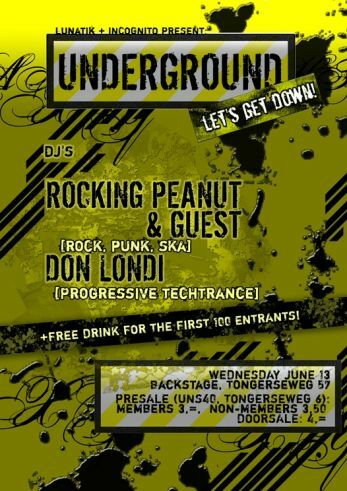 During the evening a mixture of music will be provided by the DJ’s Rocking Peanut (Ska, Punk, Rock) and Don Londi (Progressive Techtrance). Doors are open at 20:30, and we will provide a free drink for the first 100 people! So be there on time! Tickets are available at the Deli Belge, and there will be a presale in our own faculty on Monday, Tuesday and Wednesday, in the canteen, between 12:00 and 14:00. Tickets cost €3,- for members, €3,50 for non-members and €4,- at the door. The party is open for everyone, so bring your friends! See you all the 13th! We are quickly approaching the summer holidays and it is time for Incognito to start thinking about next academic year. We believe we can look back at a very successful year for our association. However, there is always a room for improvement and that’s where we need your help for! Incognito is looking for active members who would like to spend some time thinking about the future of our association and/or organizing various activities. Committee members for fiKTie, who will organize next year’s introduction camp. Furthermore, you can always mail us with your ideas and suggestions even if you do not want to join any of the committees. Any feedback is welcome! The Activity Commission presents the fourth Block Openings Drink of this year. This drink will start at 20:00 at Ma van Sloun (downstairs for a change). We invite you all to enlighten us with your presence. As usual it won’t be all about the drinks, there will be a intellectually challenging exercise. Beer will be offered at a discount. To make use of this discount, you must wear your KT-shirt or bring your Incognito Membership Card! This news post provides you with the final information on tomorrow’s Career Day. The Career Day will not be held at our own faculty but will take place in the Karl-Dittrich room at the Student Service Centre(SSC). The map on the left shows the location of our faculty(“Universiteit Maastricht”) and the Student Service Centre. Participants who registered are welcome from 11:45. The actual Career Day starts at 12:00. One of the board members wil welcome you at the entrance of the SSC. We proudly present you the Incognito Career Day on 7 februari 2007. We hope we managed to find some interesting companies for you. For students this day not only represents a good opportunity to get acquainted with the business world. You also get a chance to see what kind of job you may get, or even take the first step to get that job! It is also a great opportunity to find thesis topics or an internship. So it will be an interesting day for ALL students and educational staff. The presentations will be in the Karl Dittrichzaal, Bonnefantenstraat 2, Entrance of the Student Service Center. Because we want to know how many people we can expect on this day and because the number of participants has its limit, we want you to subscribe for this day. Subscribing is very simple. Reply to this mail with your name and your i-number and we put you on the list. You can also subscribe at the list on the coffee machine in the cantina. Only people that subscribe will get a free lunch!! You will also receive a program of the day one week before. We hope to see you all on Wednesday 7 February 2007. P.S. For all first and second year students participating the regular lectures of 7 February will be rescheduled. Zuipen voor het Goede Doel! Volgende maand begint Luna-tik de eerste in een reeks benefietfeesten. Dit jaar gaat de opbrengst geheel naar Mustangh Foundation. Mustangh staat voor Maastricht University Students Twinning A North Ghanaian Hospital en is een stichting die een aantal jaar geleden door twee Maastrichtse basisartsen in het leven is geroepen. De organisatie wordt geheel draaiende gehouden door 15 studenten. Uitgangspunt is het bevorderen van de kwaliteit van het Gonja District Hospital in Noord-Ghana. De eerste resultaten zijn zeer bemoedigend. Dit jaar heeft Mustangh zelfs de prestigieuze studentenprijs gewonnen. In oktober is de bouw begonnen van een geheel nieuwe afdeling van het ziekenhuis: een kindervleugel voor 40 bedden. Maar er is meer geld nodig! Kom daarom allen naar het MOJA feest op 9 november in de Kadans! Bands zullen het feest laten swingen op de groundfloor en DJ’s maken het gezellig in de kelder. Van elk drankje dat genuttigd wordt, gaat 20 cent naar Mustangh. De volledige EUR4 van het kaartje gaat naar de foundation, deze worden voorverkocht in UNS 40, Café Zondag en de Preuverij. Aan de deur zijn de kaartjes EUR5. Kom dus op 9 november en bouw mee aan het ziekenhuis! Barkin spreken over graduate studie in de Verenigde Staten. maar voor weinigen weggelegd en de VS kent meer goede universiteiten. Rechten, MBA, exacte wetenschappen en sociale wetenschappen/letteren. teruggekeerd vertellen over hun ervaringen. studeren. De toegang is overigens gratis. Kijk ook op: www.fulbright.nl, op de nieuwspagina. The pictures of yesterday’s block opening drink(BOB) are online. You can find them in our renewed pictures section in the album “Activities 2006/2007”. We think it’s say to say that the BOB was a success and would like to thank all of you who showed up during the evening. Good day, students of Knowledge Engineering. First we want to thank all the people that helped us and visited the cantus. It was a raging success according to us and the feedback we received, especially the day after! Before the upcoming exams, Incognito has several announcements to make. Yes, the exams are only a few days away, but this fortunately also means that the next B.O.B. is only a week further! This time the drink will be held on Wednesday 1 November at the “Ma van Sloun” (across the street) in the room upstairs. It starts at 20:00h with a ‘piekfust’; this means the beer will only cost “€0,50 cents until the keg is empty”. There is also a theme invented for this drink; LINGO! If you don’t know what “lingo” is, ask your fellow (Dutch) students. We hope to see all students and employees! If you are a member of Incognito, or want to become a member next block, then you have the opportunity to buy books at a 10% discount. The prices are in the attachment of this email. As usual, master students have to pre-order their books: contact Mark Punt for books of the Master OR. The deadline for this is Tuesday 24th October. For the Master AI no books are required. After a long delay, we finally have the K(U)T-Clothing! We really want to thank people for their patience. You can pick up your shirt or polo between 13:00 – 13:30 in room 0.013 on Thursday 19th October and Friday 20th October. If you’re unable to pick it up one of these days, then there’s the opportunity to pick it up during the B.O.B. on the 1st of November. Some time ago, most of you won’t remember probably, we promised that every member of Incognito would receive a membership card; these are finished and all members can pick them up between 13:00 – 13:30 in room 0.013 on Thursday 19th October and Friday 20th October. Again there’s also the opportunity to pick them up during the B.O.B. Enige weken geleden is er contact met ons opgenomen of er de mogelijkheid was dat er enige studenten bijles konden geven. Het gaat om de middelbare schoolvakken Biologie en Scheikunde. Als jij nog opzoek bent naar een bijbaantje en enige vaardigheden hebt in Biologie en/of Scheikunde, neem dan even contact met ons op. “De Connectie” is an artificial intelligence magazine which appears 4 times a year (http://www.connectie.org/). They are currently looking for someone who’s interested to join their editorial staff. They meet about 6 times a year and they idea is that you supply an article written by a teacher or student from Knowledge Engineering in Maastricht. If you’re interested, please contact Maarten Poeth or one of the other Incognito board members. Incognito is still looking for people that are interested in helping us organizing a party, drinks or other activities. We really need your help to make Incognito an active student association! If you want to help organize an activity or even have a good idea or suggestion, please feel free to contact any board member of Incognito. Michiel had recorded a few short movies of the cantus. Beware, the quality is very poor, but the sound is still interesting to listen to. As promised during the General Meeting, we have organised a cantus. It will be held at Cafe de Beurs, Brusselsestraat 142 at the 10th of October. You are welcome from 21:00 on, and we start with the cantus at 21:15. We will be seated in the back room of the pub. cantina, and at Wednesday from 10:30 – 16:00 in room 0.013. Of course if you run into a board member of incognito you can always ask to buy a ticket. The price of the tickets will be 12 euro for incognito members and 15 euro for other students from knowledge engineering or one of its masters. This price includes the benches, the cantus volume with songs, and as much beer as you can drink! For those people who do not know what a Cantus is. It is singing of songs (well known fun to sing songs) and drinking beer under the leadership of a ‘praesidium’, those people that lead the cantus. We also want to note to all members that the incognito board will be in room 0.013 every Wednesday from 10:30 – 16:00. Everybody is welcome to come by for a cup of coffee, chat, or with questions. At these days you can also become a member of incognito. For all members of incognito, we are still searching for students who want to be active in incognito. People who want to help organise parties, drinks, business days, or other activities. If you are interested just come by on a Wednesday, send us a mail, or talk to one of the board members if you pass us in the hallways. As you will probably have read, the board of Incognito has resigned. We would like to introduce ourselves as the interim board. We are Jeroen de Haas, Irmin Auwerda, Mark Punt, Casper Gielen, Michiel Moonen and Maarten Poeth. We will temporarily govern Incognito until a new board has officially been elected. To elect a new board we will organise a general meeting for all members of Incognito. This general meeting will be held on Wednesday september 20, 2006 at 18:00 in room 0.003 at the Tongersestraat 6. We will provide some snacks to appease your appetite. There will be a possiblity of becoming a member or renewing your membership of Incognito. For those interested the bylaws of Incognito can be requested from the interim secretary – Irmin Auwerda – by replying to this e-mail. Afterwards there will an opportunity to meet with the new board over a glass of beer. Zoals jullie waarschijnlijk al hebben gelezen is het bestuur van Incognito afgetreden. We willen ons voorstellen als interim bestuur. Wij zijn Jeroen de Haas, Irmin Auwerda, Mark Punt, Casper Gielen, Michiel Moonen en Maarten Poeth. Tot er een nieuw bestuur gekozen is, nemen wij de taken van het bestuur waar. Om een nieuw bestuur te kiezen organiseren we een Algemene Ledenvergadering voor de leden van Incognito. Deze ALV zal worden gehouden op woensdag 20 september 2006 om 18:00 in lokaal 0.003 aan de Tongersestraat 6. Er wordt gezorgd voor een versnapering om de ergste honger te stillen. Het is voorafgaande aan de bijeenkomst mogelijk om lid te worden of je lidmaatschap te verlengen. De statuten van Incognito zijn op te vragen bij de interim secretaris, Irmin Auwerda, door te reageren op deze e-mail. 7) Voorstel wijziging huishoudelijk reglement. Na de vergadering is er gelegenheid om het nieuwe bestuur te leren kennen onder het genot van een glas bier. Het waarnemende bestuur van Incognito. at 18:00. We hope that we will see all of you on Wednesday. As of today Incognito is without a board, as the former board has resigned.